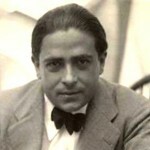 Francis Picabia was a French avant-garde painter, poet and typographist. After experimenting with Impressionism and pointillism, Picabia became associated with Cubism. His highly abstract planar compositions were colourful and rich in contrasts. He was one of the early major figures of the Dada movement in the United States and in France.